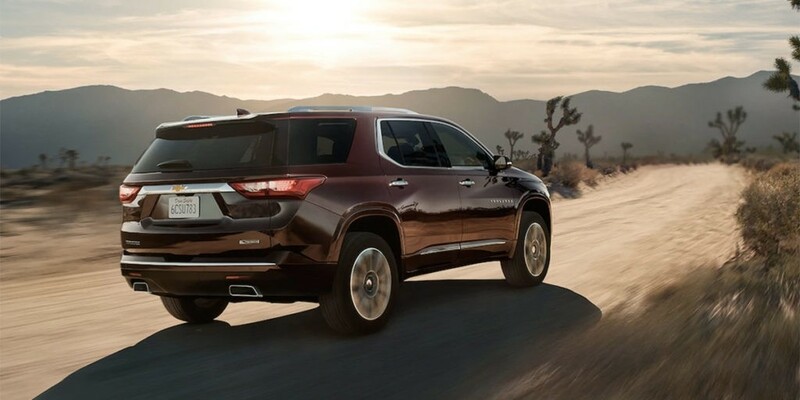 Chevy’s impressive Traverse is powered by a 3.6L V6 engine and 9-speed automatic transmission combination that delivers 310 hp and 266 lb.-ft. of peak torque. This pairing, according to JD Power and Associates, offers drivers access to an impressive 5,000 pounds of towing capability while still providing fuel efficiency of as much as 18 mpg/city and 27 mpg/highway. Drivers who want a little more boost beneath the hood can opt for the available Traverse RS package that includes access to an Ecotec 2.0L 4-cylinder engine and 9-speed automatic transmission capable of an estimated 255 hp and 295 lb.-ft. of torque while still delivering as much as 20 mpg/city and 23 mpg/highway fuel efficiency. Drivetrain Options: Drivers can choose a standard front-wheel drive drivetrain or opt for the additional control of all-wheel drive when they place their vehicle order. Twin-Clutch: For additional control, drivers can opt for the twin-clutch AWD system in the High Country trim. StabiliTrak: Every Chevrolet vehicle is equipped with the powerful StabiliTrak stability control system, which provides more or less pressure to the wheels as needed to ensure proper traction during challenging driving conditions. Traction Mode Select: An optional mode select feature allows drivers to choose FWD, 4X4/Snow, Off-Road, or Tow/Haul modes for the appropriate performance for changing road conditions. Get behind the wheel of the elegantly designed 2017 Chevy Traverse and find the performance features your commute has been missing. Contact Patsy Lou Chevrolet today at (810) 600-3330 or visit our showroom at 5135 Corunna Road in Flint, MI.